Got a quick beginner question for those more knowledgeable than me, which should be just about everyone! I'm restoring this old Hurricane, and the PO laid it down on the right side. The clip ons are all banged up now, and unusable for bar end mirrors, which I'm really hoping to run. I'm trying to pull them off, to either a) install a whole new set, or b) remove the metal tube and get a new set. HOWEVER... I can't seem to see how to remove the tube from where it goes into the body and then attaches to the fork. Any ideas? It'd be easier to get a look at it if I could get the whole assembly off, but doing that requires removing the big silver nut in this picture, which I'm assuming is the top of my shock. I'd really love to avoid any suspension related mishaps. Can anybody walk me through the correct way to remove the clip ons? Or how to replace that tube... I just can't see anywhere where it tightens in, or a bolt that would loosen it. To remove the clip on, loosen the pinch bolt, then remove the silver snap ring. Do not remove the big nut on top. It should slide right off easily. 74Demon, You sir, are a saint. I've managed to get both of them off of the forks. Now, I'd like to replace the tubes that make up the grip, if that makes sense, and keep the connector for the forks. Is that possible? If it is, I'm not seeing how. You're possibly trying to separate two parts that are actually one. Like Demon said, loosen the pinch bolt and remove the snap ring. 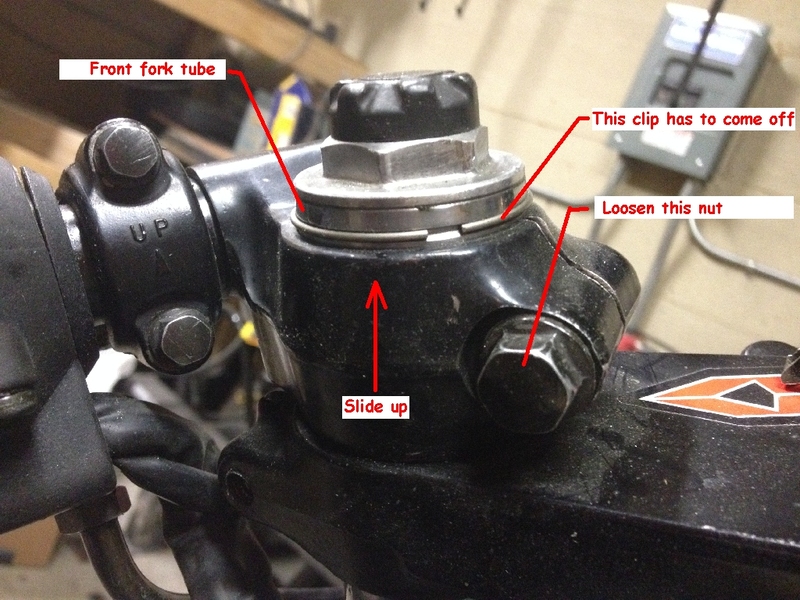 The whole clip-on assembly should then slide up and off the top of the fork. I've labeled your picture for clarity. Can you post that picture in your thread? When I click on the attachment it says that I don't have permission to view it. As stated above, you need to take the circular clip off that is in the groove in the fork tube (the fork tube is the one with the big nut on it) then loosen the clamp nut on the black part of the clipon handle bar. It will then slide up and off the fork tube. It sounds like you are thinking the hollow bar end can be removed and replaced. Some clipon handle bars allow this but I'm pretty sure the CBR bars are pressed into the clamp so you can't do that. You will need to replace the whole bar assembly. Yeah, sounds like OP is trying to replace the tubes. I do not believe they are separable. OP, where are you located? I've got a set of clip ons and brand new bar end mirrors I might be willing to let go of. CorruptFile, you hit it on the head, I'm trying to separate the tubes... and alas, looks like they're not separable. I'm located in Denver, CO. I'd definitely be interested in your clip on's and mirrors. How much would you like for them? Also, does anyone happen to know the thread size of the bar stabilizers that lie inside the OE grips? They're threaded on the end, and I'm curious to see if I can rig something up for mirrors if I knew the thread size... I'm assuming it's metric. EDIT: I looked at ebay and found these. They look in good shape and cheaper than what I would be able to ship them for. All the bar ends I've seen (albeit they were all aftermarket) had a rubber bung that was squeezed by a nut. Not sure if oem was the same or not. The few I have are metric, but the threads have varied iirc. Last edited by CorruptFile; 02-16-2014 at 12:03 PM.